"I originally became interested in studying a Psychology degree after a family member was diagnosed with mental health issues," says Iram Siddiqui. "My sister had studied Psychology and she talked about it within our family. I realised what important changes it could help to bring about in people's lives, but I wasn't sure that some of my studying skills – particularly my grammar – were good enough to enable me to study a degree." "Everyone was so welcoming and encouraging!" says Iram. "LSBU was very accepting of diversity and mature students, and I found myself fitting in with the minimum of fuss. My basic study skills flourished as part of the course and I was able to reach A-Level standard in the areas I needed to, so the next step was applying to the BSc (Hons) Psychology degree." Iram's classmates and lecturers all encouraged her to apply for the Psychology course through Clearing, and she was delighted when she discovered she had secured a place. I was determined to study at LSBU because it was local to me, and familiar. It just felt like it was the most appropriate place for me to be, so securing my place was an important moment. Upon starting her degree, Iram was able to demonstrate her potential, and she wasted no time in impressing classmates and academic staff alike with her enthusiasm, intelligence and commitment. "Considering where I started from, the confidence I found as I grew into the course and my career has been invaluable," says Iram. "My dissertation findings were published in European Addiction Research and I gave a presentation about it at an Open Day too. Research is really important to me, and I have stayed in touch with LSBU since I graduated." As well as being given the right support to get her research published, Iram also believes that the work experience she was able to secure while studying with us has played an important part in her career. "While I was on the course, I started working voluntarily for St George's Mental Health Trust," says Iram, "and after I graduated I was taken on full time. 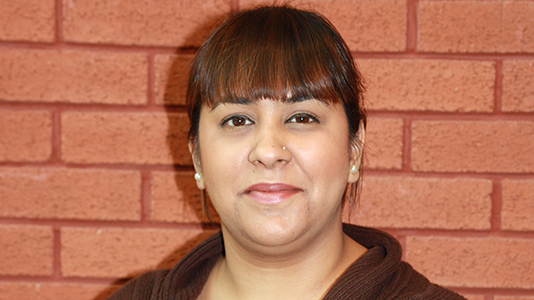 I worked in the IAPT team – Improving Access to Psychological Therapies – and am now a Cognitive Behavioural Therapist." When Iram looks back at her time at LSBU, she says that it is the unwavering help and support from the academic team that really stands out. "The staff there were simply amazing, and I felt completely supported during my time there," she says. The staff at LSBU never said no when I needed help, and it is that positive experience that has seen me return here to further my education – I have studied a PG Certificate and a PG Diploma in the Psychology department , and I would recommend the University to anyone who wants to give themselves a great start in Psychology.